“I couldn’t remember the last time I had satisfied my innate desire to make something tangible. As a young adult, I was so out of touch with my hands that I would rely on my husband to simply hang a picture frame. After years of watching home improvement channels like HGTV and DIY Network, I decided to overcome my fear of power tools and make something awesome. A side table seemed simple enough, but I immediately ran into four major obstacles: no workspace, unreliable resources, not enough time to pick up supplies, and little disposable income to buy tools for one-time use. With time, I finally completed my project. Instantaneously, my hands and heart were opened to a world that had once seemed inaccessible to women. 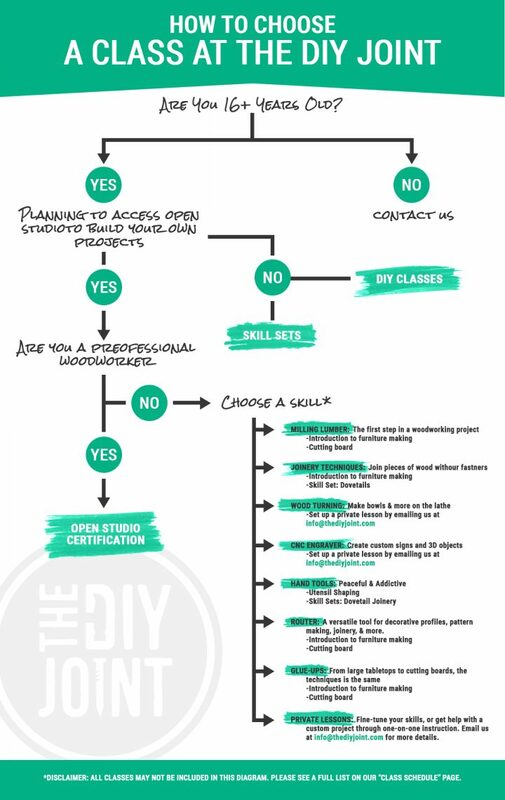 Founded from pure determination and a desire to give others an exciting, fun, and empowering experience, The DIY Joint® was established as a way to build a community of makers and creators. Located in Hoboken, New Jersey, our shared workspace is a place where anyone can come to build something awesome through our unique woodworking classes. Sharing not only space, but professional-grade tools, equipment, and skills, you can learn the craft of woodworking from friendly, expert instructors, taking the guesswork and fear out of using power tools. At The DIY Joint®, you have no reason to be nervous. It’s not about what you make, it’s about the satisfaction of doing it yourself. You don’t have to be a master craftsman to make something awesome; it’s awesome because you made it. Our goal is simple – to encourage others to take a break from their everyday lives, and try something new. But rest easy, our woodworking courses will set you up with the knowledge to ensure you can be proud to showcase in your home. If you are in the West New York or New Jersey areas, come and see for yourself what you are capable of creating in our joinery courses, and have fun learning something new!